A son, Philip, was born the fifth child of Prince Andrew of Greece and Princess Alice of Battenberg on the island of Corfu. Philip’s uncle King Constantine I of Greece was forced to abdicate the throne. Philip’s father was arrested. Philip’s father Prince Andrew of Greece was tried by a revolutionary court in Greece and was banished from Greece for life. The family moved to Paris, France where they were taken in by Philip’s uncle George and his wife Marie Bonaparte. The exiled family lived in a lodge in the grounds of their home. Philip was sent to live with his Mountbatten relatives in England in order to attend Cheam school. Philip’s mother suffered a mental breakdown and was committed to the psychiatric clinic at Kreuzlingen on Lake Constance. Philip had little conatct with her from this point. Philip’s father left the family home in Paris and went to live in the South of France. Philip attended the Schule Schloss Salem school run by the Jewish educationalist Kurt Hahn in Germany. However, following Nazi persecution he fled to Scotland and founded Gordonstoun School in Scotland. Philip transferred to Gordonstoun School in Scotland. He spent school holidays with his guardian Georgie, Marquess of Milford Haven, elder brother of his mother, but saw his father on occassion. Philip’s sister Cecilie, her husband and children were killed in a plane crash. Philip went to Germany to attend the funerals of his sister and her family. Philip’s uncle and guardian, Lord Milford Haven died of bone cancer. Philip came under the care of Dickie Mountbatten. Philip went to Venice to spend the Summer Holiday with his Aunt Aspasia, Princess of Greece and Denmark. While in Venice Philip spent time with the American actress Cobina Wright. Philip left school and became a cadet at the Royal Naval College in Dartmouth, Devon. Philip met Princess Elizabeth and Princess Margaret when they made a royal tour of the Royal Dartmouth Naval College. Philip and Elizabeth began to correspond by letter. After war broke out Philip was persuaded to finish his naval training by his cousin, King George II of Greece. Philip spent time with Canadian debutante Osla Benning who was living in England at the time. Philip graduated from Dartmouth Naval College and was sent to sea on the HMS Ramillies where he saw action in the Indian Ocean as a midshipman. Philip was transferred to HMS Valiant in the Mediterranean Sea where he took part in the Battle of Cape Matapan. Philip returned to England and spent more time with Osla Benning. Philip spent a part of his leave at Windsor with the Royal Family..
Philip became a lieutenant and served on board the destroyer HMS Wallace. Philip stayed with the Royal Family at Christmas. He was taken with the 17 year old Princess Elizabeth. Philip was appointed First Lieutenant of the destroyer HMS Whelp in the Indian Ocean. Philip’s father died in Monte Carlo. Philip was serving in Tokyo Bay when the Japanese surrendered ending World War Two. Philip returned to England from the Far East. He stayed at Kensington Palace with his grandmother and also with his uncle, Dickie Mountbatten. He began to visit Princess Elizabeth frequently. Philip attended the wedding of Princess Elizabeth’s new lady-in-waiting. Prince Philip was invited to Balmoral for three weeks to shoot grouse. It was almost certainly during this stay he asked King George VI for permission to marry Princess Elizabeth. King George agreed to the marriage but said that the couple had to wait until the Princess was 21. Philip of Greece renounced his Greek nationality and became a British subject. He took the surname Mountbatten. He also converted to Anglican faith. Lieutenant Philip Mountbatten and Princess Elizabeth were formally engaged to be married. Philip of Greece was created Duke of Edinburgh, Earl of Merioneth and Baron Greenwich. Philip, Duke of Edinburgh and Princess Elizabeth were married at Westminster Abbey. None of Philip’s surviving German relatives were invited to attend the wedding. The royal couple began married life by living at Windlesham Moor near Windsor Castle. A son, Charles Philip Arthur George was born to Elizabeth and Prince Philip at Buckingham Palace, London. Philip and Elizabeth moved to Clarence House, London. Philip became First Lieutenant of HMS Chequers stationed in Malta. Philip became Lieutenant Commander of HMS Magpie. A daughter, Anne Elizabeth Alice Louise was born to Elizabeth and Prince Philip at Clarence House, London. Philip left the Royal Navy and he and Princess Elizabth returned to Clarence House because King George VI was in poor health. Philip, Duke of Edinburgh and Princess Elizabeth were appointed members of the King’s Privy Council. . Prince Philip was promoted to the rank of commander. He resigned his command to fulfil royal duties. Philip and Elizabeth left Britian to begin a tour of East Africa, Australia and New Zealamd. While Philip and Elizabeth were on tour in Kenya, the news was received that King George VI had died. Elizabeth was now Queen. Prince Charles became Duke of Cornwall and Rethesay, Earl of Carrick, Lord of the Isles and Baron Renfrew upon his mother’s accession to the throne. The funeral of Elizabeth’s father, King George VI was held at St George’s Chapel, Westminster Abbey. Although Philip had hoped that his wife would take his surname Mountbatten, it was announced that Elizabeth would retain the surname ‘Windsor’. Philip, who had been having flying lessons, became a qualified pilot. Elizabeth was crowned Queen at Westminster Abbey by Dr Geoffrey Fisher Archbishop of Canterbury. It was the first royal coronation to be televised. During the ceremony Philip pledged his allegiance to the Queen. Philip and Elizabeth left Britain to make a seven-month tour of the Commonwealth. Philip and Elizabeth returned to Britain. Philip made a tour of the Commonwealth on the royal yacht Britannia. It was his first solo tour. While in Australia he opened the Summer Olympics in Melbourne. Philip founded the Duke of Edinburgh award scheme. Philip, Duke of Edinburgh was granted the style HRH. He became known as Prince Philip Duke of Edinburgh. Prince Philip, Duke of Edinburgh swore an oath of allegiance to the Queen in Canada. Philip’s son, Prince Charles was created Earl of Chester and Prince of Wales. A son, Andrew Albert Christian Edward was born to Elizabeth and Prince Philip at Buckingham Palace, London. 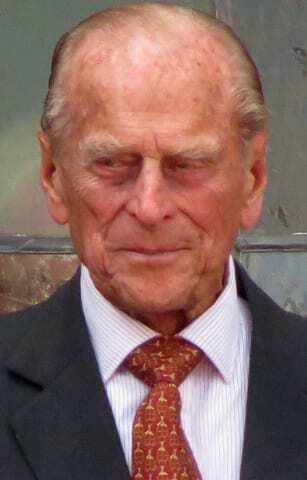 Prince Philip became President of the World Wide Fund for Nature. A son, Edward Antony Richard Louis was born to Elizabeth and Prince Philip at Buckingham Palace, London. Prince Charles was made a Knight of the Garter. Philip was present at the investiture ceremony when Queen Elizabeth invested Charles, as Prince of Wales at Caernarvon Castle. Philip and Elizabeth’s daughter, Princess Anne, married Captain Mark Phillips at Westminster Abbey. Prince Charles was made a Knight of the Bath. Prince Philip and Queen Elizabeth embarked on a three month tour of Britain to celebrate her Silver Jubilee. Elizabeth’s second cousin, Lord Louis Mountbatten was assassinated by an IRA bomb off the Western coast of Ireland. Philip wrote to his son, Prince Charles, telling him to either propose to Lady Diana Spencer or break off the relationship. Philip and Elizabeth’s son, Prince Charles, announced his engagement to Lady Diana Spencer. Prince Charles married Lady Diana Frances Spencer at St Paul’s Cathedral. A son, William Arthur Philip Louis was born to Prince Charles and Lady Diana. Michael Fagan broke into the Queen’s home, Buckingham Palace and entered her bedroom before police were called and he was arrested. A son, Henry Charles Albert David, known as Harry, was born to Prince Charles and Lady Diana. Philip created a stir when he made an offside remark about ‘slitty eyes’ while on an official visit of China. Both Prince Philip and Queen Elizabeth tried to effect a reconciliation of the marriage of Charles and Diana. They were unsuccessful. The Sunday Times published the first part of Andrew Morton’s book ‘Diana, Her True Story’ which was fiercely critical of the Royal family. Windsor Castle, one of Elizabeth’s properties, was partly destroyed by a fire. Queen Elizabeth made a speech calling 1992 her annus horribilis. It was announced in the House of Commons that Prince Charles and Lady Diana were to separate. Prince Philip took part in celebrations to mark the anniversary of VJ day by marching with other World War Two veterans. The marriage of Prince Charles and Lady Diana was formally dissolved. Lady Diana Spencer was killed in a car crash in Paris. The Queen was fiercely criticised for remaining in Scotland rather than returning to London and also for not flying the flag on Buckingham Palace at half mast following the death of Lady Diana. Queen Elizabeth made a public broadcast commending Diana and expressing her feelings as a grandmother for her two grandsons. Prince Philip, Prince Charles, Prince William, Prince Harry and Charles Spencer walked behind Diana’s coffin. Elizabeth’s sister, Margaret, died following a stroke. Elizabeth’s mother, Elizabeth known as the Queen Mother, died at the age of 101. Prince Charles married Camilla Parker Bowles. The ceremony was held in a registry office and was intentionally low key as many people blamed the relationship between Charles and Camilla for the divorce and subsequent death of Diana. Elizabeth celebrated her 80th birthday. A service of Thanksgiving was held at St George’s Chapel, Windsor and also at St Paul’s Cathedral to celebrate Queen Elizabeth’s official 80th birthday. Prince Philip and Queen Elizabeth celebrated their diamond wedding anniversary. Prince Philip was admitted to hospital to be treated for a chest infection. Elizabeth’s grandson, second in line to the throne, Prince William, married Catherine Middleton at Westminster Abbey. Prince Philip celebrated his 90th birthday. The Queen created him Lord High Admiral of the Royal Navy. He announced that he would begin to reduce his public duties. Prince Philip was taken to hospital after suffering chest pains. To celebrate the Diamond Jubilee, Queen Elizabeth and Prince Philip visited England, Scotland, Wales and Northern Ireland, Prince Charles and Camilla visited Australia, Canada, New Zealand and Papua New Guinea while her grandson William and his wife Kate Middleton visited Tuvalu. Celebrations were held throughout the Commonwealth to celebrate Elizabeth’s Diamond Jubilee. Despite poor weather thousands turned out to witness the Thames Diamond Jubilee Pageant where 1,000 boats and barges sailed up the River in procession. A live concert was also held outside Buckingham Palace. Philip was admitted to King Edward VII hospital suffering from a bladder infection. Elizabeth accompanied by Prince Philip officially opened the London Olympic Games. Queen Elizabeth appeared as a ‘Bond Girl’ in a short film made for the opening ceremony. Philip was re-admitted to hospital with a recurrence of a bladder infection. Philip was admitted to the London Clinic for an abdominal exploratory operation. A son, George, was born to Prince William and Catherine. He became third in line to the throne. Philip was made a knight of the Order of Australia for royal service. A daughter, Charlotte, was born to Prince William and Catherine. She became fourth in line to the throne. Queen Elizabeth became the longest reigning British monarch having surpassed the reign of Queen Victoria. Prince Philip celebrated his 95th birthday. Prince Philip attended church without the Queen because she was ill with a bad cold. Philip attended the New Year Church Service without the Queen because she continued to be unwell. Queen Elizabeth celebrated her sapphire jubilee having been Queen for 65 years. Philip made his last official royal engagement. Philip was admitted to King Edward VII Hospital for a hip replacement operation. The operation was a success and he was discharged 11 days later. A son, Louis Arthur Charles was born to Prince William and Catherine. He became fifth in line to the throne. Philip attended the wedding of his grandson, Prince Harry to Meghan Markle at St George’s Chapel Windsor. Philip attended the wedding of his granddaughter, Princess Eugenie to Jack Brooksbank at St George’s Chapel Windsor. Philip missed the Remembrance Day service for the first time. Prince Philip was involved in a road traffic accident after his Land Rover collided with a Kia near Sandringham. The Duke was shaken but unhurt. It was reported that Prince Philip had voluntarily given up his driving license.